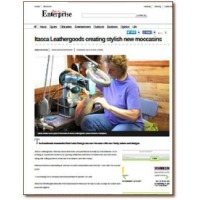 Since undergoing a change in ownership in April 2012, Itasca Leathergoods has been lucky enough to have been featured with articles in several major newspapers as well as online blogs. Some, such as Northland Press' article of May 2012 or the "Fun Finds" feature of the May/June 2012 Lake Country Journal Magazine aren't featured online. Others, however, have online links. We maintain a Facebook page that acts as a blog for our customers and interested parties. Closer to home, the Bemidji Pioneer ran a full page feature in October 2012: Stitching Success: Itasca Leathergoods Expanding. 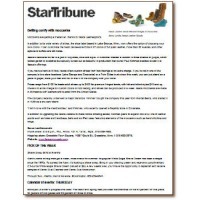 The major newspaper of Park Rapids, MN, the Enterprise, did a major feature focusing on the recent growth of the company and expansion of its workforce with the headline Creating Stylish New Moccasins in July 2012. 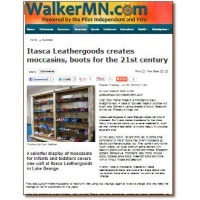 Also closer to our original Factory Store, the Pilot Independent, the major newspaper of Walker MN, did a major feature on Itasca Leathergoods in July 2012 with a headline Itasca Leathergoods Creates Moccasins, Boots, for the 21st Century. The Star Tribune (Minneapolis' primary daily) featured us in early June 2012. The newsprint edition of the paper featured us in a half-page article on the Style+Fashion page, but the online version combined us with another article and put us as the second half of the article under the Getting Comfy With Moccasins tagline. If you can find the paper edition, it's a great feature! Mpls/StPaul Magazine's online blog, Ali Shops, featured Itasca Leathergoods in June 2012, pointing out our style and custom order capacity. 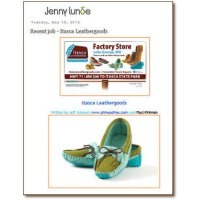 We loved her headline: Turquoise Moccasins. Yes. In May 2012, we hired professional photographer Jenny Lunde to shoot images for some promotional pieces, billboards, advertising, and our 2012 website re-launch. Many of the product images were taken by Jenny, who set the standard we continue to follow. She also featured us in her blog.